Ive been working 15 years in the dive industry and I get asked almost every trip, “where is the best place to dive?” or “where is your favorite spot?”. It’s a difficult question to answer because every place is special and unique, and also the conditions of a place can vary so much throughout the year. There are many great liveabaords to choose from in Asia, so the choice can be a bit overwhelming. After reviewing and trying many of these operators we have come up with the best liveaboard in Asia. We will give you a few alternatives for each location to suit your budget. If you have never dived by liveaboard before, don’t wait any longer. It is the best way to dive and only way to get to the remote and untouched parts of the sea. All trips have full board and snacks, some charge extra for Nitrox and alcoholic drinks. Also you can read our page about general liveaboard information to know more. If you already know in which country you want dive, then click below or just scroll down. In Indonesia are some of the best liveaboard in Asia. You can find everything here from the tiny Pygmy Seahorse too Mantas and Whales. Also this country is located inside the coral triangle, the most bio-diverse region in the world. The region is home to 76% of all coral species in the world and a home for 52% of Indo-Pacific reef fishes and 37% of the world’s reef fishes. More than 3,000 species of fish live in the Coral Triangle, countless species of invertebrates, mollusks, and 6 of the world 7 turtle species. It is also know as the underwater “Amazon” by some. Everyone has heard of Bali, but among the dive locations in Indonesia it can’t compare to its remote and untouched archipelagos in the Banda Sea, the Molecullas and Raja Ampat. These regions are very remote which makes access more difficult and more expensive, but definitely worth it!!!. You can dive here all year round, but the best time to would be from October to April. Divers can expect a range of topography here from soft corals and sea fans, to hard corals, sea-grass beds, mangroves, shallow reefs, deep drop offs, caves, black sand and white sand. You might also find frog-fish, mandarin fish, ghost pipe-fish, harlequin shrimp, flamboyant cuttlefish, hundreds of different species of nudibranch, bumphead parrotfish, oceanic manta rays, dog-toothed tuna, jacks, Hammerhead sharks, 6 species of turtles, thresher and silvertip sharks, Wobbegong sharks and epaulette sharks, whalesharks, mobula rays, spinner dolphins, orcas, blue, pilot, and humpback whales, and many more. This is a beautiful traditional Phinisi boat. It is one of my favorite boats. They have a wonderful crew catering to 12 divers in 7 comfy AC rooms. They have different itineraries depending on the season. When they are in the Banda islands they will visit Genung Api, a true natural wonder. If you are there in October or November there is a good chance to see hammerhead sharks. They travel to the Moleculas, Ambon, Banda Islands, Western Papua, and Komodo. Coming here is a once in a lifetime experience you don’t want to miss. This boat is with out a doubt, among my personal top 5 best liveaboard in Asia. They have trips from 7 days to 11 days, and prices vary from €1600-€3000. This is another stunning traditional Indonesian boat. It travels mainly in central Raja Ampat. Barefoot Conservation NGO operate the boat and all profits from the trips go towards science, research and conservation programs. She can take 12 guests in 2 large 4-share cabins and 2 smaller twin cabins (All cabins have AC). So not only will you be enjoying some of the best diving in the world but also you will be aiding in protecting it. Most of their trips are around 7 days and prices are around €1480 year round . If you prefer the feel of a modern boat, then this is the boat for you. This luxury catamaran mainly travels in the Ambon and Banda Sea region. An Amazing region where you visit some of the most pristine reefs with all the small critters you can imagine. Also with a bit of luck you may encounter spinner dolphins, orcas, blue, pilot, and humpback whales. She takes 18 guests and there is a choice of 3 cabins styles on board. Each cabin has hot water shower and AC. For a 8 day journey the prices start at €2800 going up to €3100. If you are on a more tight budget but stil want to come to this region, than this boat is for you. They can take 16 guests in 8 basic twin cabins. They dive out of Sorong in Western Papua to amazing spots in the Raja-Ampat region. Simple but lovely boat with an awesome crew. For a 5 day trip they charge around €850. This classic Phinisi boat travels mainly in Western Papua and specializes in the Manokawi region. Most of the dive sites are in the Cendrawasih bay. Places where whale sharks, manta rays, reef sharks, occasional hammerheads, tuna, dolphin, whales, pipefish, frogfish and many more can be found. Also in this region there is a unique relationship between the whale sharks and the local fishermen which only can be observed here. This Liveaboard has 12 air-conditioned guest cabins, each with en-suite bathroom and TV. One of the most beautiful and best liveaboard in Asia. For a 7 day journey the cost is around €2300. If you are looking for a longer trip, this liveaboard usually goes on 11 and 12 day trips. They take you to the remote corners of the North Banda Sea, Ambon, Triton Bay and Raja Ampat. This boat caters up to 16 guests. For the duration of the trip the price is very reasonable. Many liveaboards in this region can cost around €5000-€7000. For a 11–12 day trip the price is between €3100-€3500, and for some trips free Nitrox is offered. If you want to dive Indonesia but you don’t have so much time then a good option with also stunning diving, is Komodo. You can get there via Bali. Plus there is the added bonus of visiting Komodo itself. The unique island inhabited by the impressive Komodo dragons. A good time to come here is between May and October. The diving around the islands you can see white tips, black tips, grey reef sharks, turtles, frogfish, manta rays, dungong, banded pipefish, mandarin fish, Wonderpus, Indian Ocean Walkman, and many more critters of all sizes. A great contender among the best liveaboard in Asia destination lineup. This liveaboard travels between Raja Ampat and Komodo depending on the season. It is a wonderful budget option with good service and a great crew. The food is also delightful. They cater to only 9 divers. The Empress is a unique steel dive boat with a curious dive elevator at the back!!! For a 5 day trip they charge around €740. This is another classic Indonesian boat. They have great crew with awesome dive guides. The Jaya can take up to 16 guests. After a days diving in Komodo’s mad currents you can chill out on the deck in comfy bean bags and soak in the scenery and contemplate the amazing dive you just did. They mainly do 4 day trips, but have the occasional 7 day trip. For a 4 day trip they charge around €594. An island nation of over 7600 islands and only 2000 are inhabited. There are some truly remarkable reefs here but only a few liveaboards available. Philippines like Indonesia is in the coral triangle, and also has over 500 species of reef-building coral. The main region being the Tubbataha reef located in the middle of the Sulu Sea. It is only accessible 3 months per year, April to June. It is a protected UNESCO world heritage site. Divers may encounter up to 11 species of sharks here including Whale Sharks. Also there are Manta Rays, all the usual suspects, Barracudas, Napoleon Wrasses and Tuna. This Sailing Catamaran will take you on a unique journey. Visit the reefs from a small-intimate vessel and experience the true island nation. The catamaran takes only 8 guests, so the dives sites won’t be crowded at all. Of course living on a small boat like this is not for everyone, but all facilities are available. There’s even wifi and the food very tasty. For me this boat would be in my top 5 best liveaboard in Asia. Tubbatah from April-June for a 7 day trip is about €1600, the rest of the year they sail to Apo and Coron reefs making 5 day trips for €860. A classic liveaboard boat visiting the Tubbatah reef. A great steel hulled boat with 20 cabins of different sizes. The crew is lovely and prepares some great dishes. Also the bartender makes some mean cocktails. The boat has all the facilities and a very experienced crew. Tubbatah from April-June for a 7 day trip is about €2000, the rest of the year they sail to Apo. Steel hulled liveaboard, not the most spacious, but has all the facilities you need. The crew is friendly and helpful. They have 8 cabins, which also aren’t the biggest, so best you share with someone you know. The reason you want to take this liveaboard is their Visayas shark special journey. It takes you to Leyet to swim with the whale sharks, and then to Malapascua to see Thrasher sharks. The boat will also stop at Bohol and Apo island for some dives. With some luck you may also see mantas, hammerhead sharks and if very lucky a tiger shark. This trip runs from October to Febuary for 7 days and costs about €1900. Now this is a very remote destination with some of the best liveaboard in Asia. Just getting here can be difficult and require a bit of time. However if you do make it, this is one of the most pristine regions in the world, far away from mass tourism. Also in the coral triangle, life is abundant on the reefs. There are also a few interesting WWII wrecks to be found. The reason you want to come here is because of Milne Bay reef. A place frequently visited by National Geographic and Neville Coleman. The visibility in the bay can be up to 50m. Along the north coast at some of the drop offs we can sometimes see Hammerhead sharks and Whale sharks as well as Devil and Manta rays. For the Macro fanatics the reef is carpeted with soft and hard corals and all the strange/bizzare critters live here too. A heaven for muck diving. This is truly a fantastic liveaboard, which has 5 cabins and space for 10 guests. The guides and crew are some of the best I have seen, they have about 30 years experience in the area. A really big bonus is that you have unlimited dives, as long as your computer allows it!!!!. A little pricey but well worth it and a strong contender in the top 5 best liveaboard in Asia. They have 11-13 day trips to Milne bay, the 11 day trip costs around €3300. On the southern tip of Myanmar’s wild coastline is the mostly unexplored Mergui archipelago. To be able to dive here you have to start your trip from Thailand. You can take a liveaboard from either Ranong or Kao Lak. This is a very unique experience to this long closed part of the world. Here you can find all kinds of creatures. You can see all the “usual suspects”, plus Harlequin shrimp, seahorse, Ghost-pipefish, and frogfish. Also you can see Nurse & Blacktip sharks, tunas, and Cobias. With a bit of luck you might encounter a whale shark, manta ray, Guitar shark and Grey Reef sharks. An amazing archipelago in the true spirit of best Liveaboard in Asia. An awesome custom built dive boat that leaves from Kao Lak. She can take 24 guests in 12 cabins. There are different style cabins, but all have their own bathroom. The food is delicious and plentiful. The crew are also very friendly and helpful. This boat operates between Thailand and Myanmar from October to May. For their Myanmar journey of 7 nights they charge around €1300. This is a smaller steel hulled boat which carries a maximum of 12 divers.. They have six simple fan cooled rooms with shared bathrooms. The service is good and staff professional. Everything is tidy and the cook makes lovely authentic Thai food. Some nights they will have an awesome BBQ onboard. For the Myanmar trip of 6 days the price is around €1100 and for the 8 day trip €1500. Just when one hears this name an image of paradise appears in our mind; a paradise with abundant marine life, clear waters, and deserted islands. If you decide to go here, you will find its reputation is not exaggerated, it definitely has some of the best liveaboard in Asia. The best way to dive here is indeed by liveaboard and not from a resort. You can dive here all year round. However the best time is from November to the end of April (though this is also the most expensive time to come). This is when the waters are clearest. If you want to visit the famous Hanifaru bay (Baa Atoll) then its best to come from June to September. If you are lucky you might see hundreds of manta rays at once here in a plankton feeding frenzy. The best dives in this region are in strong currents (so bring a reef hook). This is when all the big creatures can be seen: Manta rays, all kinds of sharks, Dogtooth tuna, eagle rays, devil rays, and many more. Some atolls also you have frogfish, Leaf-scorpion fish and some unusual nudibranchs. Also expect many schools of fish and moray eels, like the beautiful Honeycomb moray. With some luck maybe a dolphin or a whale shark can be seen too. This is one of my favorite boats in the Maldives travelling to the best sites south of Male. Their trip usually travels 5 atolls, from North Male to South Male, Rasdhoo, and Ari Atoll. Also sometimes they go a bit further to Felidhoo or Meemu atoll. The crew is very helpful and professional. There are 10 rooms on board that fit 24 divers. The minimum requirement to dive with them is Advanced Open Water with 50 logged dives. This is great because they take you to some sites with really strong currents. Two of my favorite highlights were diving at Rashdoo with Hammerhead’s and a night dive with nurse sharks and Manta rays. One of the best liveaboard in Asia and Maldives. This trip for 8 days costs €1000-€1600 depending on the season. An exceptional boat so beautifully built. The rooms are spacious and there is a Jacuzzi to chill in and the bar has a cold beer tap!!!. The service is good and the staff experienced. Also a smaller dive boat accompanies the liveaboard. This boat will be taking you diving and this is where the tanks are filled. The journey concentrates around the Male Atolls and Ari Atoll. They can take 24 guests in 10 rooms. You need a minimum 40 logged dives to come with them. In the off-season their journey takes 8 days and costs around €1200 and in the high season they travel for 10 days and cost €2250. This boat only operates in the “high season” and travels mostly to North & South Male, Vavu, and Ari atoll. They offer you all the best and classic dive spots. The rooms are very nice and they also travel with a dedicated dive boat. One of the highlights is an awesome BBQ on a deserted island, absolutely fabulous. If conditions allow, you might dive Cocoa Corner and Kandhooma Thila. Maybe you can see Grey Reef sharks in large numbers at a cleaning station here. Also they require minimum Advance Open Water and 50 logged dives. Their 8 day trip from October to April cost between €1400-€2400. This is a floating luxury hotel with all the facilities. As the name hints it has a spa but also yoga classes and even a Jacuzzi. The food, the service and boat are simply exceptional. You will be pampered 24/7 and live in very spacious and luxurious rooms. They travel the classic central route and sometimes to the northern atolls. If you don’t only want to see the best dive spots but have real ”holiday” then this is the boat for you. Another added bonus is they have free Nitrox. Their 5 day trips start €1100 and the 8 day trip goes for around €2200. This is one of the best liveabaords for the experienced. They require a minimum of 100 logged dives and also that you’re AOW. They have many different itineraries going north and south from Male all year round. It has very spacious and comfy rooms with their own bathrooms. The boat also has a dive vessel accompanying. For me this boat would be in my top 5 best liveaboard in Asia. Their 8 day trips start at €1400 going up to €2400 for 12 days. If you are not that experienced but also want to experience the wonders of the Maldives. This is the boat for you. They have no minimum requirement to come on board. Don’t worry they will take care of you and show you all the wonders these waters have to offer. Of course experienced divers are also welcome for whom they have FREE nitrox and will dive in separate groups. This is an all-round great boat and crew, giving you a great value for your money. Mostly they dive the central atolls, but in the off season they make a few trips to the spectacular manta madness at Hanifaru bay. Their 8 day trip goes from €1300-€1900. Thailand use to be among the 10 best dive destinations in the world. However after many years of over-fishing this has declined. Fortunately in the last 5 years a big effort has been made to protect this natural heritage and is making a remarkable recovery. So if you don’t have that much time or your budget is a bit tight, this is a great option. You can still find some spots with huge schools of fish, a few good wrecks, critters of all sizes (nudis, harlequin shrimp, ghost pipe-fish and seahorse), and on some spots you can also see sharks, whale sharks, turtles, and oceanic manta rays. This boat takes you to the classic liveaboard destination in Thailand, the Siliman & Surin Islands. These islands are only open to divers from October to April. There are many boats that can take you there, but this is one of the best. They are very experienced and the boat is great. They take 24 guests in 10 cabins. Each room has AC and its own bathroom. When booking make sure your itinerary goes to Koh Bon, Richileu Rock, and Koh Tachai. These are the best spots here. Their 5 day trips costs around €600. A custom built boat by dutch naval architects. They mainly operate the Siliman and Surin Islands. However at the Beginning and end of the season they usual combine the trip with the south Andaman. Visiting Hin Daeng and Hin Muang, two deep pinnacles where Oceanic Mantas can be seen with some luck. The twin cabins are very luxurious and have their own private balcony. Their trips last 5 to 6 days and cost from €1000-€1300 (Oct-Apr). Taking a journey on this boat is a unique experience in itself. It is a traditional merchant trading boat that has been completely renovated. The outside as well as the inside are simply beautiful. It has even starred in a 007 movie. In the low season iy travels the South Andaman and in the high season, North to the Siliman & Surin Islands. The southern trip goes to many of the best spots in the Koh Phi Phi area including Hin Daeng, Koh Bida Nok, and Shark Point Marine Sanctuary. Another contender for the top 5 best liveaboard in Asia, not because of the diving, but the boat and its history, and the uniqueness of the area. Krabi province in Thailand, is a world surrounded by natural beauty. That’s why its popularity has exploded in the last decade and accounts for the large number of accommodation and restaurant options you have available now. There are small hotels, large chain hotels, dorms, guest houses, private vacation villas, luxury resorts, and simple bungalow’s available to suit all budgets. So the choice can be a bit overwhelming and so many ask where to stay in Krabi? The choice you make for your stay should take several factors into consideration when deciding where to stay in Krabi. Of course for many people the first thing they look at is the price. If you are planning an active holiday with many excursions, there is not much point to staying at an expensive resort. In the end it’s a bed where you sleep. If you are planning a relaxing holiday at the pool with only a few activities, it’s good to stay at a nice resort. I have been living in Ao Nang for the better part of the last 11 years and have seen the town grow. Also I have been working with tourist here during this time. So from my experience here, I have complied a list of the best places to stay in different locations, budgets and itineraries. Apart from Ao Nang, you can stay in Klong Muang, Railay, Tonsai, Longbeach, Tubkaek Beach, Ao Nammao, or Krabi Town. Ao Nang Cliff Beach Resort, just the pool is worth staying here!!!! It is not the most beautiful town, and has gotten busy in the last years. Yet if you want live central and have access to many restaurants, nightlife and shopping options, it’s the place to stay. From here you can reach Tonsai, Railay Beach, and Poda Island just by hopping on to a local longtail boat from the beach. Also you can rent a bike here and explore the area or join one of the many tours offered to visit the natural wonders. Careful when booking a place here, they may say they are close to the beach, yet they are quite far out of town and you will require a taxi every time you want to go somewhere. You can visit this area all year round, though best avoid 15th of December until the 10th of January if you can, this is when it is busiest and accommodation is most expensive. The oldest resort in Ao Nang. It has the largest property with a lush garden right on the beach and in the center of town. A very beautiful place to stay if you plan to do a lot of relaxing. A beautiful resort right next to the beach promenade. Very close to the center of town, yet quiet and away from the main road. This is also a stunning spot to watch sunset, get a massage, or enjoy a drink right on the beach without having to move far at all. The place with the most spectacular views in town. Beautiful rooms and great service, well worth the money. Its infinity pool alone makes it worth it to stay here (scroll up for photo). Small and cozy place in the back of town, with a beautiful view of the mountain. A very friendly family run property, with home cooking, and stunning 2 story studios. Highly praised by its guests. Probably my favorite place in Ao Nang. Lovely bungalows set in a beautiful and lush garden, right in the middle of town. The price is very reasonable and you are only a 5 min walk from the beach. A simple but peaceful place to stay right in the middle of town, great value for money. Simple classic Thai bungalows in a beautiful quiet garden. These beaches are on a small peninsula easiest accessed by boat. It is possible to come here on low tide from Ao Nammao bay. However this is a bit of an adventure and definitely shouldn’t be undertaken with your luggage…hahaha. So basically the peninsula is like an island because it is cut off from the mainland by 300m high cliffs and mountains. This is a climber paradise, but also great for chilling and kayaking. Here you can find all kinds of accommodation, from simple palm huts in the jungle, to one of the most expensive resorts in Thailand. Beautifully set in an idyllic and quiet garden. The rooms are very comfy, the pool has great views, the staff is friendly, and the food is simply delicious. What more can one want. A nice and quiet resort on the backside of Railay East. The rooms are spacious and great value for money here. Many rooms have lovely balcones to chill & relax. This is one of Tonsai\’s classic places to stay. It is very popular with backpackers and climbers. The prices are very reasonable and has a great family feel. The most beautiful and modern property on Tonsai. When swimming in the pool you are surrounded by an amphitheater of cliff\’s. Their restaurant is also very good. These beaches are to the north of Ao Nang, about 20-40min away by car. Long beach is very quiet, there is not much here except a few basic small resorts powered by generator. Its a bit of a journey in time, because most of Thailand was like this 15 years ago. This a perfect place to escape the crowds. Though if you stay here, best if you know how to drive a motorbike, since you are far away from everything, even 7/11 shops, which is hard to believe in Thailand. Klong Muang and Tubkaek beaches are still in development and are slowly growing. In this area you have some of the best beaches on the mainland. Often clear water, no people, and not so many noisy longtail boats disturbing the idyllic silence. Here there are a few accommodation options, though most of them are 3-5 star resorts. This area is definitely one of the best choice when deciding where to stay in Krabi. This is an idyllic and very quiet beach away from the hustle and bustle of Ao Nang. The staff is friendly and have a simple but good restaurant. A perfect place to chill, look at the horizon, and read a book while enjoying a shake. Not far from the above property. A little bit more upscale, but still simple and reasonably priced. The owner’s are very friendly and helpful, and will organize anything you might need. All resorts on this beach are upscale. Though of the choice here, this is the most beautiful one. Also for what you get, it’s very reasonably priced 4 star resort. Perfect for a romantic weekend on the best beach in the area. A simple, laid-back and modern resort. Very tastefully decorated. Some rooms have fantastic balconies right on the beach, which is rare around here. There is even an Irish pub in walking distance. A well established 4 star resort in this area. They have an amazing pool with amazing surroundings. The staff are phenomenal. I have friends that swear by this resort and stay here every year since 8 years!!!!. Ao Nammao bay is between Ao Nang and Krabi town, on the other side of the Railay peninsula. A very laid back spot with only a few accommodation options. There are some wild quiet beaches, and you can easily get to Railay from here by boat or Kayak. Also a very nice choice when deciding where to stay in Krabi. The resort has been recently renovated and everything is new. The resort has a private beach and they have free kayaks for the guests. From here you can paddle to Railay in an hour. Also the restaurant here makes amazing food. 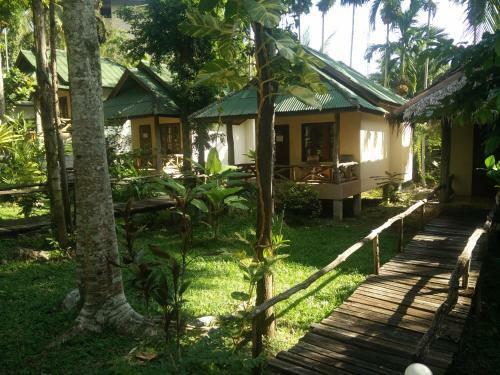 A traditional bamboo/palm bungalow resort right on the beach. The perfect place to chill. The restaurant and bungalows are set amid a beautiful tropical garden. This was one of the first resorts established in this area. Krabi town is a very laid back town. There is almost no night life here or much for the tourist. The center of town is very small where you can find a few dorms, guest houses and hotels. There is a small shopping mall, a daily morning and night market for food, and a weekend night market with some handicrafts and lots of great food. Though other than that there is not much. So if you are looking for a more authentic Thai experience, or have a tight budget, or planning to do a lot of exploring, then this is the place to stay. Food, renting a bike and accommodation is much cheaper than anywhere else. 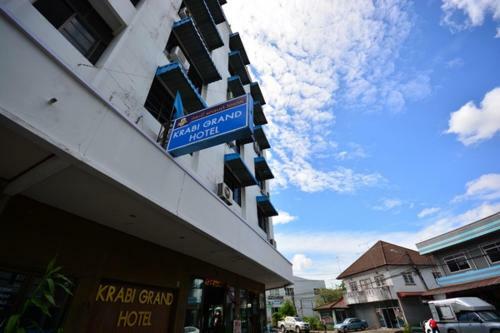 The perfect choice for proper travelers and backpackers when deciding where to stay in Krabi. A simple and laid-back guesthouse right in the middle of town. The GH has been around for a long time and has a great atmosphere. The owners are very knowledgeable and helpful about the area. A new and modern Hotel in the center of town. They have big rooms and a great swimming pool. Staff are friendly and there are many food options near by. This is a standard 2-3 star hotel. The rooms are big and spacious. Also it is in the center of town and great value for money. Many restaurants and markets nearby. These are some of the best places to stay in the area. Of course there are many more choices, this was a rundown of the most noteworthy. 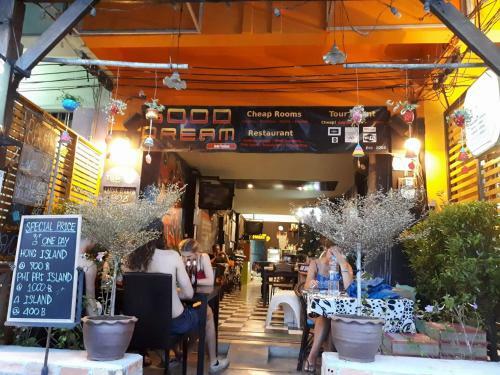 I know there are just as many restaurants as there are accommodation options, so please check out our blog about the best restaurants in Krabi. If you in the area and are interested in diving, check out our blog about diving in Krabi. If would like to see an amazing places away from the crowds, visit Crystal Lagoon Krabi. Also have a look at our page about discovering a different Thailand for some inspirational tips.